Welcome to my World Surf Guide! Here you'll find the planet's top surf sites, magazines, photographers and surfboard shapers. Many of 'em are personal mates! Liquidmagonline.com. Nothing but the best surf articles, interviews, photos & journals. MP: The Life Of Michael Peterson. The book of the legend, by Sean Doherty. Pitpilot (UK) is funny and interesting, full of tail busting but disgusting stuff. Planeta Surf: Mexico's first & only surfing magazine. Written in Spanish, about Mexicans. 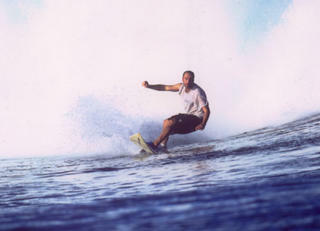 Planetsurf.net, your online surfing resource. RA TV is definitive boardriding television. Featuring surfing, skateboarding, snowboarding, longboarding & bodyboarding, RA is the brainchild of world champion surfer, Barton Lynch & pro surfer, Stuart Bedford Brown. Sarge's Daily Surf. The latest surf photos, news and goss with tour legend Sarge. SurfAid International, a non-profit humanitarian aid organization. Surf Europe. Europe's mightiest. Published in English, French, German, Spanish & Portuguese. SurfINSIDE. Surf reports, forecasts, surfing pics and online shop. The Surfers Journal. Clean Surfing. Artful Photography. Intelligent Writing. More Book than Magazine. The Surfer's Path. The world's first 100% green surfing magazine. The Surfers Group, formed by Barton Lynch, offers a consultancy service; develops the careers of surfers, snowboarders, skaters, musicians; and owns RA TV! Tracks magazine. The surfer's bible, online or off. Waveride. Surfing the lifes' waves. Waves. Now filthy, all-new and improved.